Join us for or the next in the series of Automation Happy Hour events. This time we are talking about Kubernetes with one of the top experts on it. 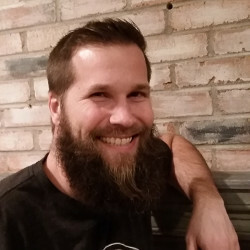 Michael Ward is the Principal Systems Architect at Pearson responsible for leading technical design around enterprise Platform-as-a-Service based on Kubernetes. Prior to Pearson, Michael has spent many years in the industry in various roles including Chief of Site Reliability at Ping Identity, the Identity Security company. Take him for a beer and pick his brains on anything you like. You might even come away with something valuable. He is the speaker at the upcoming KubeCon in London and an uber-active members of the ST2 Community. 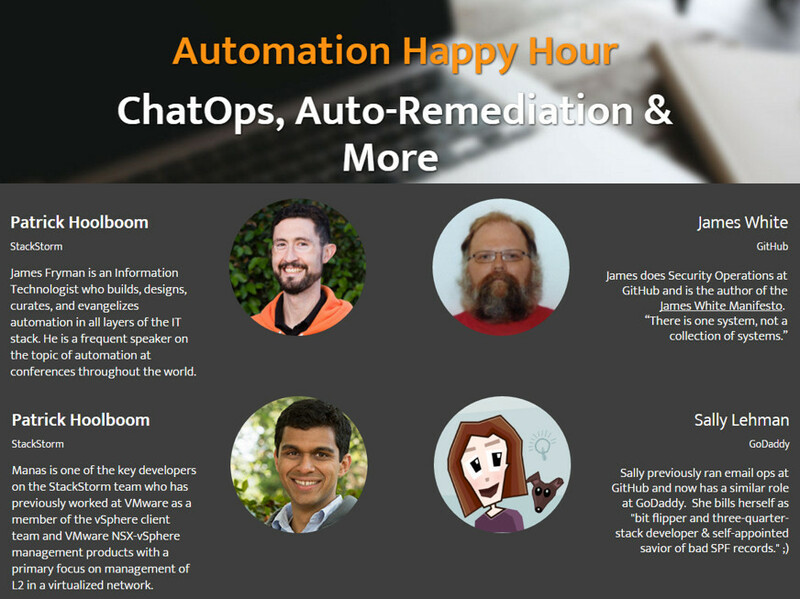 Automation Happy Hour #10 – ChatOps, Auto-Remediation, and More! Automation Happy Hour #10 is in the books! This wan the first one this year. James Fryman was piloting seat this one but Patrick should be back in the captain seat for the next AHH. A panel of guests included Alex Makarski, who us gave a marketing ops perspective on ChatOps, Sally Lehman of GoDaddy, and James White of GitHub. 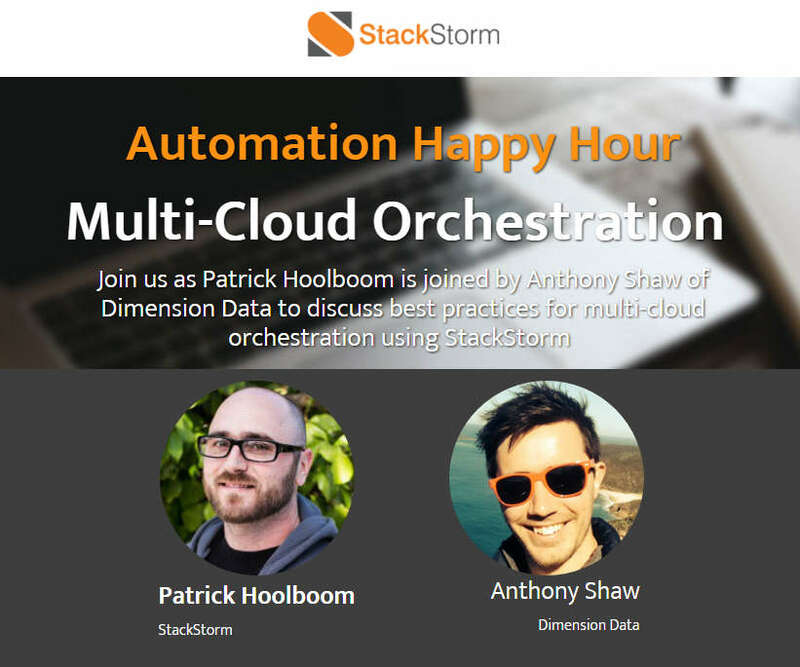 For this Automation Happy Hour, Patrick Hoolboom is joined by Anthony Shaw of Dimension Data to discuss best practices for multi-cloud orchestration using StackStorm and Libcloud. Anthony is a Product Development Manager, Innovation and Research for Dimension Data in Sydney, Australia. Within ITAAS global R&D team, he is responsible for driving technical innovation, automation and integration strategies for Dimension Data cloud and other. Patrick Hoolboom discusses project details with Sayli Karmarkar and Jean-Sebastien Jeannotte, Senior Software Engineers from Netflix and asks them in-depth questions. Sayli Karmarkar is a software engineer with 7 years of experience in developing platforms and services to configure and manage thousands of systems in an enterprise. She is passionate about designing systems with focus on scalability and performance. Sayli worked at Red Hat on their systems management platform (Satellite) used to efficiently deploy, configure and monitor RHEL infrastructure. Jean-Sébastien is a seasoned Linux (System|Software) engineer with 13 years of experience automating management of physical, virtual and cloud based systems, as well as designing and developing software solutions and tools. Self-starter with deep knowledge of Amazon Web Services and Python/Bash shell scripting, he is very passionate about solving production issues through automated remediation. Since 2013, he is working as a Senior Software Engineer for Netflix. Check out the July 31st discussion below, and as always, please feel free to follow us on Twitter at @Stack_Storm and tweet specific questions using #AskAnAutomator. We’ll do our best to answer your question during the next Happy Hour. StackStorm CEO Evan Powell joined Eric Wells of Fidelity Investments and Grant Richard of Goldman Sachs as part of a panel addressing how to build successful data-driven data centers. 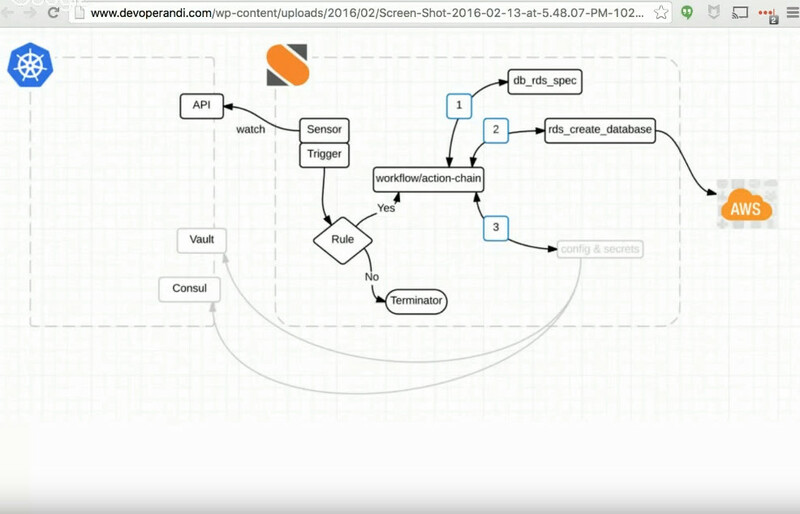 Stormer James Fryman presented on “Managing IT outages with Icinga and StackStorm” at this month’s ChatOps San Francisco Meetup; check out his full presentation below. 500 Terry A Francois Blvd. Cisco Spark hosted an interactive meetup outlining key takeaways from the recent rollout of their second generation automation tooling. Stormer James Fryman’s presented on the current state of ChatOps, and soft and hard considerations when adopting ChatOps. Stormer Patrick Hoolboom spoke at this month’s BayLISA Meetup, which regularly includes system and network administrators across a range of skill levels. Check out photos from the event when you have a moment! BayLISA meets the third Thursday of every month to discuss topics of interest to system administrators and managers. The meetings are free and open to the public.